Elizabeth Arden's Green Tea family has a newest sibling: She's sweet, charming, young, fresh, and full of life. She takes you on a stroll in sunny fields and invites you to lay on the grass and share fairytales, lovingly hands you a flower along with that sweet, sweet childlike smile, and takes your hand as you run together to the bright and dreamy horizon. She's every bit of you and your childhood fantasies. She's no other than the new Elizabeth Arden Green Tea Honeysuckle. Green Tea Honeysuckle brings to mind nostalgic memories of your childhood and captures your youthful daydreams. The classic zesty fragrance of Green Tea is mixed with the warm and honeyed scent of Honeysuckle for a scent that is both invigorating yet heartwarming. Click READ MORE and meet the Green Tea line's newest sister! "For me, Honeysuckle is sheer exuberance in a perfume. When I smell it, I immediately think of the long welcomed Spring and celebration of summer yet to come. I was also inspired by the extremely rich and decorative Art Nouveau floral prints. Their repeating patterns that weave flowers, leaves, birds, and butterflies evoke nature and the Honeysuckle vine." Plain and simple, Givaudan designed Green Tea Honeysuckle as an ode to the cheerful yet calm spirit of the Spring season and the vibrance of youthful femininity. Top notes are comprised of Lemon, Tangerine, Boysenberry Blossom, and Green Tea vapors, Middle notes have Wild Honeysuckle, Ylang Ylang, Jasmine, Tunisian Neroli, and Green Tea Leaves, and Base notes have Soft Musk, Summer Peach, Nectar, Ambrette Seed, and White Birch. 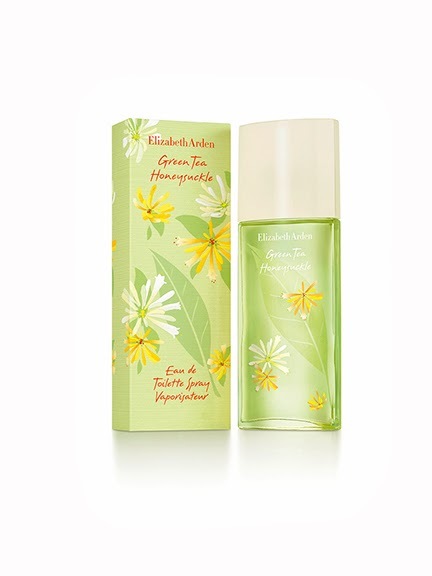 Elizabeth Arden Green Tea Honeysuckle is available in 50ml (P2,250.00) and 100ml (P2,950.00), and in all Rustan's stores nationwide. Please visit RUSTAN'S on Facebook for more information about this product. parang i saw this sa isang online shop.. i dunno if its original because it cost Php1100 only.. I wann to try! Sana may magregalo sa birthday ko. haha. Parang it smells so fresh and sweet!